Stephanie Azar says she is something of a budget hawk — every penny at the Alabama Medicaid agency has to be accounted for at all times. As commissioner and general counsel for the program, Azar said being able to defend every dollar that goes out of her doors makes it slightly easier when asking state lawmakers for money — especially in a deep red state that is skeptical of federal programs. About 1 million low-income Alabama residents are beneficiaries of the insurance provided jointly by the state and federal government. In fiscal year 2015, the agency received $685 million from the Alabama general fund, taking up 39 percent of the state budget. Azar said she is constantly meeting with lawmakers and making presentations to get the funds — or at least some of the funds — she needs. It’s a task that consumes her daily. 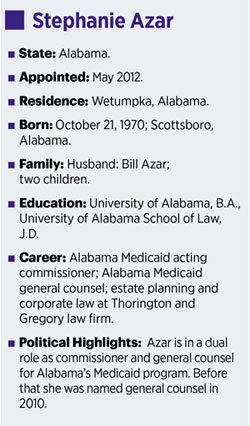 Azar has been part of Alabama Medicaid for 17 years, serving as general counsel before becoming acting commissioner in May 2012. Before starting to work for Medicaid, she practiced estate planning and corporate law at a firm in Montgomery. Aside from the political and daily managerial tasks, Azar is working on an overhaul for how the program cares for patients. And other states are watching. On Feb. 9, the federal Centers for Medicare and Medicaid Services approved a waiver that allows Alabama to create 11 regional care organizations to help Medicaid beneficiaries with primary care, behavioral health and specialty care. The state could receive up to $748 million over the next five years if they meet their benchmark goals. Azar said the waiver is “a huge milestone for the state of Alabama” and one of her greatest accomplishments so far. Alabama’s managed care system is comprised of state approved providers who offer healthcare services to Medicaid beneficiaries and are paid a fixed monthly fee per patient. The regional care organizations will run the program instead of insurance companies. “There are other states going to managed care but our RCO transformation is a provider based, from the ground up, grassroots type of thing and it’s not being done anywhere else in the country,” Azar said. Alabama’s health care landscape is unique; many beneficiaries suffer from obesity and related problems such as high blood pressure, and the state has an alarming infant mortality rate. Tricia Brooks, a senior fellow at the Georgetown University Center for Children and Families, said legislators don’t always appreciate the complexity of their Medicaid programs, leading to underfunding. With the RCO project ahead, Azar is also turning her attention away from the buzz of a potential Medicaid expansion in Alabama. Jim Carnes, policy director for Arise Citizens’ Policy Project, a non-profit focused on helping low-income Alabama residents, said while he wishes everyone was moving toward expansion, there’s nothing Azar can do if the governor isn’t pushing for it. The stakes are even higher for Medicaid’s budget battle this session as the regional care organization program could be in danger. Azar is requesting the legislature give Medicaid an additional $100 million to support the transition. But on Feb. 24 the Alabama Senate General Fund Committee proposed giving the agency the same amount as last year. Besides cutting back services, Alabama would be in violation of its federal waiver, which stipulates the state has to maintain its current Medicaid program. -- Marissa Evans is a staff writer for CQ’s State Report team, covering health policy. Follow her on Twitter @marissaaevans.